When you have been given admin for your affiliation you can set up your own forum and decide who you want to be able to see it. Wtih admin status more options are opened up to you and an admin tag appears on the top row. Press this tag and open up the forums tab along the top. In the drop down box for 'Add new category' you should only be able to see your own affilliation, press the add button at the side of this drop down box. There is now a new category created, press the edit button to change the settings on it. Name: this is the name that you want this group to be, for example IMP. 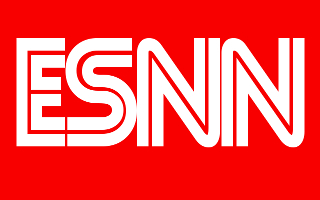 Click in the box to edit the text. Group: if you are a simple admin this should only show your group, site admin have more options. Click the apply button to save your changes. In the drop down box for new forum you should see only one option again, press the add button. Under your renamed 'new category' there should now be 'new forum'. To edit the details for the new forum click on the link. Edit the name of the forum by replacing the text in the box. Group and category will show no other options for basic admin. Security is the level of access that can see that forum and you can set that to the appropriate level you want to be able to see that forum. When you are happy with the new name and settings press apply to save the changes. You can create more than one forum for different users and if you make a mistake or no longer need a forum you can delete the forum using the delete button. It will give a confirmation if to delete or not so that you can not delete a forum by mistake and it is not possible to delete a forum that contains posts. If you now press the forum tag on the top row you should see a new forum added in your main forums page. 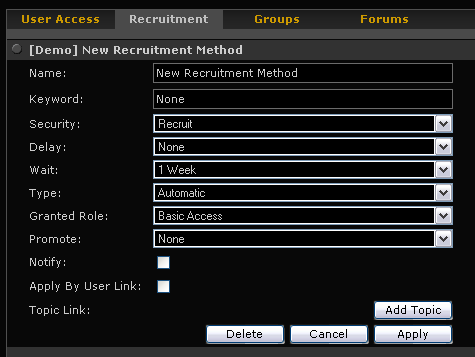 As before go into the admin tag on the top row but this time select the recruitment tab. Select the correct group from the drop down box (on basic admin there should only be one choice) then press the add button and that will add a new recruitment method. Click on the link to edit it. Different levels of recruitment can be created for your forum and depending on how the security levels are set different levels of access can be seen by different people. You can authorise new recruits to see only basic information then as they become more trusted you can increase their access to your forum. Name: This is the name that you will see when it comes up in notifications (assuming you have notifications turned on in your home tag). For example new player, or security level 2 or anything else that makes sence to you. Keyword: this is what you give to the player to be able to register with your forum. Security: this is the level that this user can see. This level is tested when looking at the forum and the library. New users can be given basic access all the way up to affiliation leaders having their own section. Delay: this is how long the recruitment method lasts before it is activated. For example a new recruit might have to wait 2 weeks before given basic access depending. Wait: this applies to votes. It is the time between the start of a vote to finalising the vote. Type: you can use several different types of recruitment depending on how you want to run your affiliation. Automatic: the player is automatically accepted onto the forum. Veto/delay/yes: existing voters get to veto, delay or say yes to the new recruit. Majority yes: existing voters have to have a majority yes vote for the new recruit to allowed access. Recruiter authorised: this give a notification on the home page to anyone with recruiter or admin. They then have to act to authorise or deny the applicant. This is the method that is recommended to be used for most cases. Granted roles: you are able to select the roles from the drop down menu to apply. Roles can be created specifically for your group. 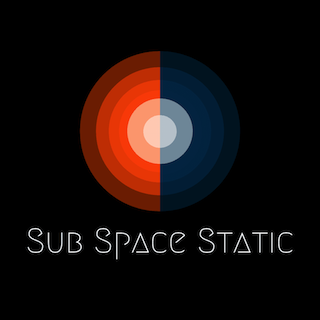 Basic access is read/write forum/library/news/game info. Voter access is basic access plus the ability to vote on recruitment depending on security level. Promote: this shows any other recruitment method the exists in your scope. Notify: tick this box to have notificaton appear on home page. Apply by user link: this creates a link that people can access by going into their perferences. This is an alternate way to the keyword method of applying. Either or both ways can be used. When you are happy with the choices you have made press apply to save the changes. If you want to change anything simply reclick on the link to edit once more. If you no longer want this recruitment method to exist press delete.